In the latest Ali Reynolds mystery from New York Times best-selling author J. A. Jance, Ali takes to the high seas with her husband. Roger McGeary, a brilliant software engineer, has gifted himself with an upscale cruise in honor of his 40th birthday. When he falls to his death from the balcony of his stateroom suite, the incident is quickly declared a suicide. Only his maiden aunt, a tough-as-nails woman who runs a racehorse refuge, refuses to take "case closed" for an answer and turns to Ali Reynolds at High Noon Enterprises to look into the situation. ©2017 J. A. Jance (P)2017 Simon & Schuster, Inc.
High Noon employee Stuart Raney is contacted by the aunt of Roger McGeary, a former high school friend and fellow misfit computer geek. She asks him for help to find Roger’s murderer. Apparently, Roger fell or was pushed off a luxury cruise ship. The authorities call it a death by misadventure but his aunt insists he was murdered. B Simpson and Ali Reynolds agree to help the aunt. Owen Hansen, a recluse obsessed with suicide, has hacked a psychotherapist patient data base and is tormenting patients/victims. Ali has to figure how all these ties together and solve the murder. The book is well written. The book features Stuart and B and their computer expertise more than prior books. The plot contains information about artificial intelligence which was interesting. The suspense builds throughout the story and the pace is steady. Enjoyed the trip around the Monterey Bay area that Jance provided. There were two educational topics in the book one on suicide the other about artificial intelligence. I read this as an audiobook downloaded from Audible; the book is almost 11 hours long. Karen Ziemba does a good job narrating the book. Ziemba has narrated the entire series. One of the worse narrators I have ever heard. Wooden reading, nasal voice, and pauses in wrong places. Jance usually writes interesting, intelligent books. The Ali Whatever is not my favorite but the Joanna Brady books are great. I couldn't give this one a chance because of the awful reading. Would you try another book from J. A. Jance and/or Karen Ziemba? What was most disappointing about J. A. Jance’s story? Dull characters—I don't care about any of them except the AI. Plodding plotting—excessive repetition of "what we know so far." I HEARD YOU THE FIRST TWO TIMES. DO NOT add an "accent"—and I use the term loosely—to a character specifically described as speaking unaccented English. DO NOT turn every dependent clause into a question. 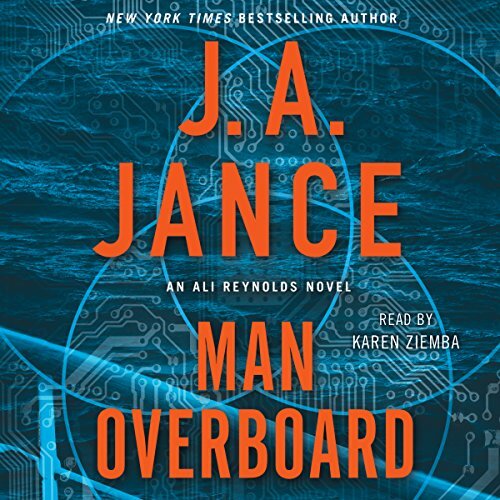 What character would you cut from Man Overboard? Is this real about computers?? Would you listen to Man Overboard again? Why? What does Karen Ziemba bring to the story that you wouldn’t experience if you just read the book? It made me wonder if this was true about artificial intelligence or are we back to the 2001 movie, but there are others with the same idea. Up to now, I have enjoyed the Ali series. After several failed attempts, I was unable to finish this it was so boring. Most likely will not be purchasing Ali series in the future. The story is predictable because there is no need for guesswork. The narrator is tiresome with her strange mix of reading and characterization. Overall this audiobook was only OK.
J.A. Jance has written a nice addition to the Ali Reynolds series, and I'm still liking it. The story is fast paced and full of interesting characters. Many people said that it was boring, but it held it held my attention until the end, so I gave it 4 stars. Recommended to all, especially computer geeks. Nice buildup and structure with a really disappointing ending. Felt that the author was in a hurry to finish the book. This is not as good as some of the others in the series in my opinion. A sequel to Man Overboard, but just not a really exciting mystery or solution. I thought Man overboard much more interesting... this book seems a segue to future books, a means to advance Stuart's or others characters for future books.